A quick and simple one from this week’s deployment of Lync Server 2013. We got Persistent Chat up and running, created a category, and gave our test user rights to create rooms. 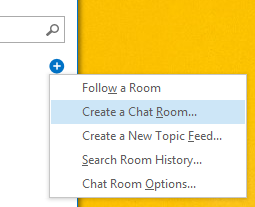 Signed in to the Lync client, we selected “Create a Chat Room…”. ..and we were hit with this error: Server could not process your request. Please try again later. No errors in the Lync or Application event logs, and the only reference to the error I could find was this blog post at pro-lync.be. However, that problem relates to SBA-homed users, which definitely wasn’t the issue here. The answer was in the IIS log for the Lync internal web site – by default, under C:\inetpub\Logs\W3SVC<siteID>\ (usually the lower siteID is the internal site). We saw the requests for /PersistentChat/RM?clientlang=en-US – but the username was that of the user who had logged in to Windows, not to Lync. When we logged in to the PC as the test user, signed in to Lync and tried again, we got the chat room management page as expected and everything worked fine.